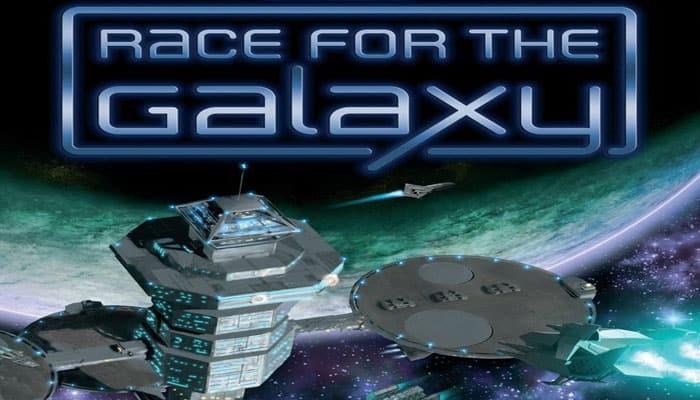 Race for the Galaxy is a card game where players build galactic civilizations that represent worlds or technical and social developments. Each round consists of one or more of five possible phases. In each round, each player secretly and simultaneously chooses one of seven different action cards and then reveals it. Only the selected phases occur. For these phases, every player performs the phase's action, while the selecting player(s) also get a bonus for that phase. After revealing the cards, each player adds his development to his tableau of cards on the table and then discards cards from his hand equal to its cost. Each player who chose Develop discards one card fewer as his bonus. Explore allows a player to draw cards and select which of them to add to his hand. Settle allows a player to place a world in his tableau. Some worlds produce goods when Produce is selected. These goods can be discarded for victory points or sold to add cards to the player's hand by selecting Consume. With cards, players can settle new worlds and build more developments, gaining both victory points and card powers that provide advantages in certain phases. The winner is the player with the most victory points. Place 12 victory point (VP) chips per player in 1 and 5 VP chips nearby. Set aside the 10 VP chips (and any left over chips) for use only during the final round of play. Each player takes a set of seven different action cards.